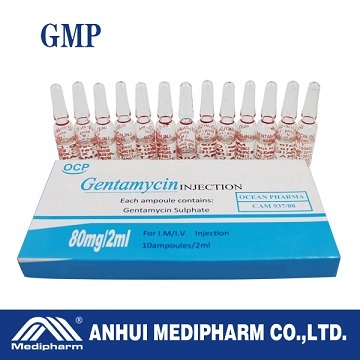 Indications: Gentamicin injection is indicated for the following conditions, when caused by susceptible organisms; 1. Urinary tract infections; (Not indicated for the treatment of uncomplicated urinary tract infections). 2. Systemic infections, e.g. Septicaemia, peritonitis; 3. Bone and soft-tissue infections, e.g. osteomyelitis, wound and soft-tissue infections; 4. Infected burns; 5. Infections of the respiratory tract e.g. Pneumonia. Storage instructions: Store below 25℃. Protect from moisture. Keep out of reach of children.